The August 14, 2014 issue of the Troy Times-Tribune is available. 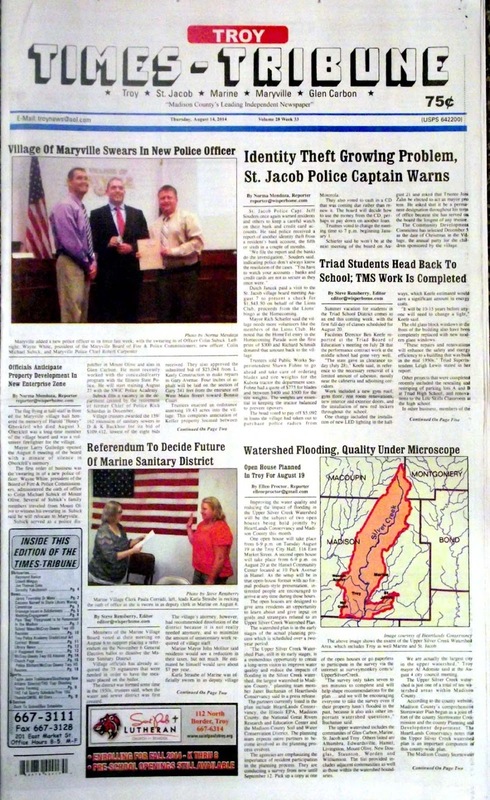 Some of the headlines in this issue: St. Jacob Police Captain Says Identity Theft is Growing Problem, Maryville Hired New Police Officer, Triad Students Head Back to School, Referendum to Decide Future of Marine Sanitary District, Watershed Flooding and Quality to be Studied, Cassens Named to State Public Library Management Committee, Simon Pays Visit to Troy: Subdivision Residents Concerned About Drainage Issues, Maryville to Get TIP Funding for Main Street Improvements; plus a column about learning things the hard way, a special series of photos about the 2-14 McCray-Dewey Alumni Reunion, police blotters, and the complete 2014 Triad High School Fall Sports Schedule. We have obituaries for Raymond Barker, Lowell Mingus, Jon Thomas Sims, and Dorothy Yakubovich.